Never able to shake their high-school-era band name, Williamsville’s Wild Knights became one of the region’s top drawing bands in the 1980’s and early 90’s, packing Western NY clubs for long evenings of music by The Grateful Dead, The Allman Brothers, The Band and more. Band members Mike Bellman, Joe Bellanti, Corey Kertzie, Mark Marsack and Dave Ruch got back together in 2018 with long-time friend Rolf Witt filling the bass chair, and quickly sold out their first performance. A packed night at Buffalo’s Town Ballroom followed, and they haven’t looked back. 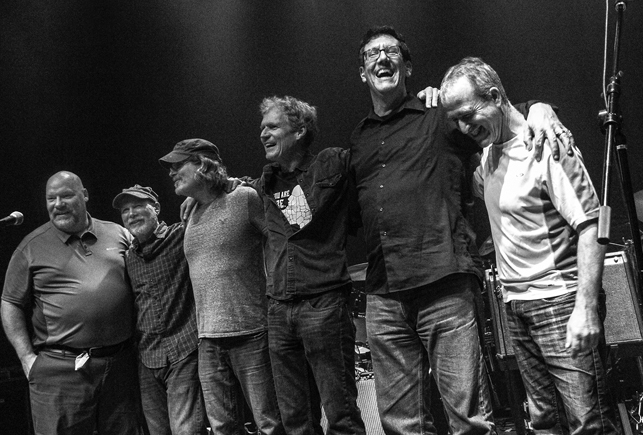 With two full drum kits, two lead guitar players battling it out on the Allman Brothers tunes, a world-class honky tonk piano player, and a deep catalog of music by The Grateful Dead, Bob Dylan, Neil Young, The Band and more, this is music made in the moment by seasoned professionals who love to improvise.